The government of Manitoba announced the winners of its 2016 Excellence in Sustainability Award, part of TomorrowNow—the province’s green initiative. The awards honour people, projects, and ideas that successfully turn the principles and guidelines of sustainable development into concrete and lasting achievements. 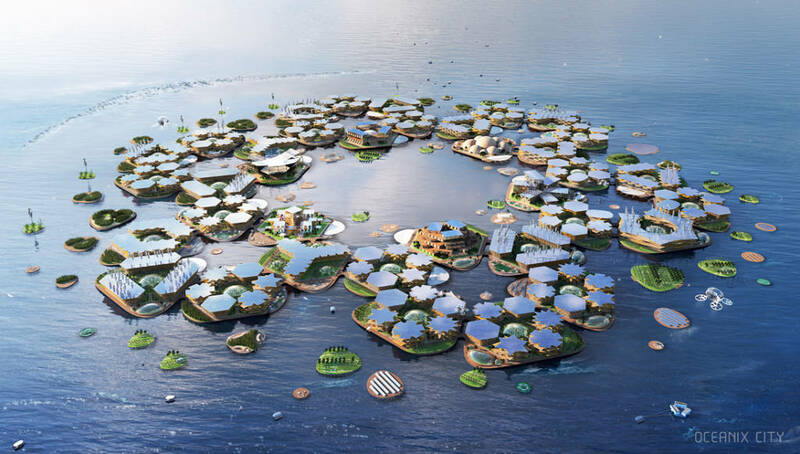 The first UN high-level roundtable on Sustainable Floating Cities brought together innovators, explorers, marine engineers, and scientists to share ideas and solutions to the threat faced by coastal cities and countries due to rising sea levels. 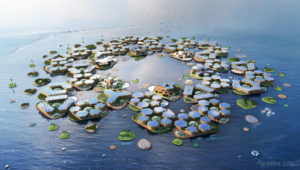 The floating city is designed to grow, transform, and adapt organically over time, evolving from neighbourhoods to cities with the possibility of scaling indefinitely. Modular neighborhoods of 2 ha (5 acre) create self-sustaining communities of up to 300 residents with mixed-use space for living, working, and gathering. 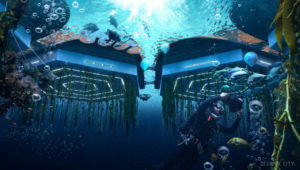 Below sea level, biorock floating reefs clean the water and accelerate ecosystem regeneration. All built structures are kept below seven stories to create a low centre of gravity and resist wind. Every building fans out to self-shade internal spaces and public realm, providing comfort and lower cooling costs, while maximizing roof area for solar capture. Communal farming is the heart of every platform, allowing residents to embrace a sharing culture and zero waste systems. 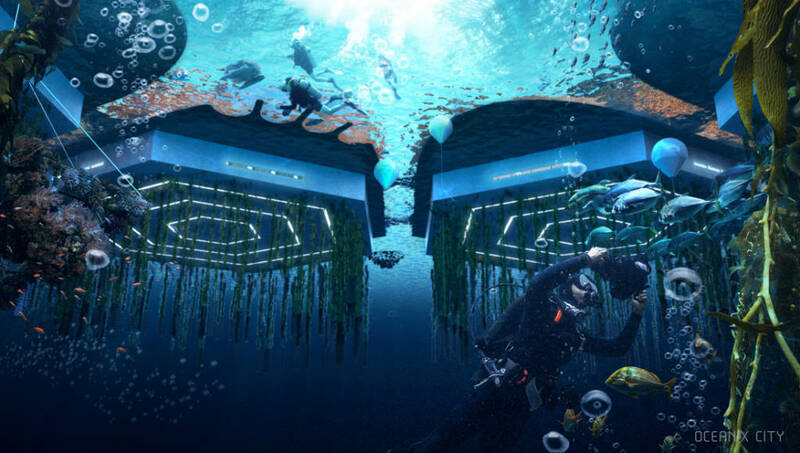 Below sea level, beneath the platforms, biorock floating reefs and seaweed, oysters, mussel, scallop, and clam farming clean the water and accelerate ecosystem regeneration. By clustering six neighbourhoods around a protected central harbour, larger villages of 12 ha (30 acre) can accommodate up to 1650 residents. Social, recreational, and commercial functions are placed around the sheltered inner ring to encourage citizens to gather and move around the village. Residents can easily walk or boat through the city using electric vehicles (EVs). Floating destinations and art, including six specialized landmark neighborhoods with a public square, marketplace, and centres for spirituality, learning, health, sport, and culture create destinations drawing residents from across the city and anchoring each neighbourhood in a unique identity. All communities will prioritize locally sourced materials for building construction, including fast-growing bamboo that has six times the tensile strength of steel, a negative carbon footprint, and can be grown on the neighbourhoods themselves. Floating cities can be prefabricated on shore and towed to their final site, reducing construction costs. Pairing this with the low cost of leasing space on the ocean creates an affordable model of living. These factors mean affordable housing can be rapidly deployed to coastal megacities in dire need. The first Oceanix Cities are calibrated for the most vulnerable tropical and sub-tropical regions around the globe.